If you throw up blood after a few drinks, you may have internal bleeding within the intestinal tract. Know the exact causes and how to heal it effectively. Throwing up blood after drinking can be alarming. Any time blood is expelled from the body it is a sign that something is seriously wrong. You may have internal bleeding within the gastrointestinal system that is being agitated by the alcohol. Those who experience this phenomenon have typically had a night of excessive indulgence or may be suffering from alcoholism. 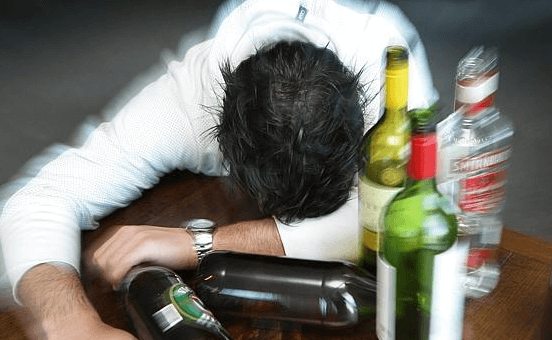 However, some medical conditions can be agitated by alcohol which can cause blood to appear in the vomit, even when you have not had a great deal to drink. It is essential that you address this occurrence as quickly as possible to minimize the damage which is being done to your body. Erosion of the Gastrointestinal Tract: Most types of alcohol have an acidic pH value. Constantly exposing your body to these corrosive substances or putting a high level of alcohol in your system at once can cause damage to the mouth, esophagus, pharynx stomach or small intestine. The lining and blood vessels in this area can be eroded, causing bleeding to occur. Over time, this can lead to the development of ulcers along the gastrointestinal tract. Rupture of the Gastrointestinal Tract: As the gastrointestinal tract is weakened it becomes susceptible to tearing. Regular throwing up, eating or intense coughing can cause this weak area to rupture, which will result in vomiting blood. This condition is referred to as hematemesis. Ulcers: Regularly drinking alcohol can cause ulcers to appear in the gastrointestinal tract, but this is not the only cause that can lead to ulcers appearing. Some are genetically susceptible to stomach ulcers. Some stomach disorders can also lead to ulcers appearing in the stomach lining. If you drink alcohol it can irritate these ulcers, leading to vomiting that is laced with blood. Frequent Vomiting: Those who frequently drink enough to cause vomiting, or those who suffer from a medical condition that causes frequent vomiting can have an increased risk of vomiting blood. The acidity of vomit can erode the tissue in the esophagus, leading to ulcers or tearing. The heaving sensation associated with frequent vomiting can also cause damage to the esophagus over time. Once the tissue is damaged, it is likely that your vomit will contain blood if you become sick. Cirrhosis: Cirrhosis is a disease of the liver that is caused by excessive consumption of alcohol which leads to liver failure over time. Once the condition reaches an advanced stage it can lead to vomiting up blood. Gastritis: Gastritis causes the lining of the stomach to become inflamed. As this condition becomes more severe it can lead to vomiting up blood. Consuming alcohol can further agitate this inflamed tissue, causing you to vomit up blood. Intestinal Tumors: Tumors in the gastrointestinal tract can cause a person to vomit blood. Growing tumors can tear the surrounding tissue, leading to internal bleeding. Consuming alcohol can agitate this damaged tissue, leading to vomiting. This vomit may contain blood if the tissue was torn recently. Drugs and Medications: Some medications can cause serious side effects, especially if they are combined with alcohol. Aspirin and anti-inflammatory drugs are well-known for causing damage when combined with alcohol. This combination can cause damage to the pancreas or stomach, leading to the vomiting of blood. See a Doctor: Once you begin throwing up blood, you should see a doctor right away. It can be a sign of a serious medical condition which can cause permanent damage to your body. Your doctor will ask questions regarding your condition to help narrow down what might be causing you to vomit blood. They will need to know if this has ever happened before, how much blood was vomited, whether the blood was bright or dark, which medications you are taken or had taken near the time of the incident and how often you smoke or drink. Answer all of these questions honestly to ensure that you get the proper treatment for your condition. Take a Blood or Urine Test: After your doctor has taken in basic information from your interview, they will determine if you will need to undergo further testing. You may need to take a blood or urine test to test for additional substances or infectious materials that may be contributing to your condition. This will help your doctor determine the best course of treatment to stop your internal bleeding. Change Prescriptions and Diet: Your doctor may adjust your prescriptions to reduce your risk of vomiting blood in the future. This may include ordering you to stop using a medication all together. To ensure that your system has time to heal, you may be given a specific diet to follow. You may be asked to eliminate acidic, spicy or foods that are difficult to digest until your system has had time to heal. Adjust Drinking Habit: If it appears as though excessive exposure to alcohol has damaged your system, you will need to have an honest discussion with your doctor regarding your habits. Frequent excessive drinking can cause damage throughout the body. If you fear that you may have a drinking problem, your doctor may prescribe medication to help you ease this habit. You can also get information about rehabilitation services or groups that can help you through the struggle of getting your drinking under control. This is vital to get rid of throwing up blood after drinking. Low Hemoglobin Count: Symptoms, Causes, Treatment and More! Why Do You Suddenly Go Off Alcohol?